The outcome of orthodontic treatment can be dramatic: beautiful smiles, improved dental health, and an enhanced quality of life for people of all ages. Orthodontic problems must be diagnosed before treatment begins. Proper diagnosis involves careful study of photographs, X-rays, and dental impressions. Pediatric dentists are trained to monitor and evaluate growth and development of the teeth and supporting bone structure. 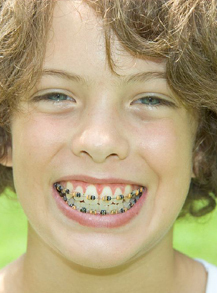 As your child grows, we will determine when orthodontic intervention is necessary. Every child is different and has different needs. Some children are in need of early orthodontic treatment (phase I) to help modify growth and development. Phase I can include retainers, expanders, and headgear. Other children can wait for traditional braces (phase II) when they have all their permanent teeth. One or more of the upper teeth biting on the inside of the lower teeth characterizes a cross/bite. Cross/bite can occur in the front and/or the sides of the mouth. Early correction of a cross/bite is recommended. Your child has an open/bite if you ask him or her to bite the teeth together and your child is unable to touch the top front teeth to the bottom front teeth. An open/bite can be caused by oral habits such as tongue thrust, thumb sucking, or when the upper and lower jaws do not grow evenly. Over/bite is a measure of the vertical overlap of the upper and lower front teeth. Excessive over/bite may be caused by disproportionate eruption of front teeth, or over-development of the bone that supports the teeth. Excessive over/bite is commonly seen in conjunction with a Class II relationship (see below). Over/bite is also known as a deep bite. Over/jet is measure of the horizontal relationship of the upper and lower front teeth. It is often called “buck teeth,” and is commonly confused with over/bite. Excessive overjet may be caused by improper alignment of the molars (Class II relationship); a skeletal imbalance of the upper and lower jaw(s); flared upper incisors; missing lower teeth; crowded or tipped back lower teeth, or a combination of all the above. In addition, oral habits such as thumb or finger sucking or tongue thrusting can exacerbate the condition. Lower teeth biting in front of the upper teeth characterize an under/bite. An under/bite is usually caused by undergrowth of the upper jaw, overgrowth of the lower jaw, or a combination of the two (Class III relationship). Under/bite can also be caused by tipped-back upper incisors, flared lower incisors, missing upper teeth, or a combination of all the above. Early correction of under/bite is recommended. Crowding is the lack of space for all the teeth to fit normally within the jaws. The teeth may be rotated or displaced. Crowding occurs when there is disharmony in the tooth-to-jaw size relationship, or when the teeth are larger than the available space. Crowding can be caused by early or late loss of primary teeth, improper eruption of teeth, or a genetic imbalance between jaw and tooth size. Spacing, the opposite of crowding, is an excess of available space, which results in gaps between the teeth. This generally occurs when the teeth are smaller than the available space. Protrusive teeth, missing or impacted teeth, or abnormal gum tissue attachments can also cause spacing. Spacing in primary teeth is good to see because the permanent teeth are always bigger than the primary teeth. The extra space allows for the new teeth to have room to erupt.